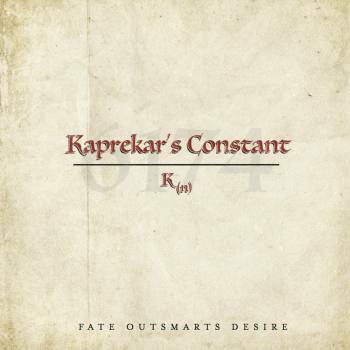 Kaprekar's Constant evolved around eighteen months ago from the activities of songwriters Al Nicholson (acoustic guitar, electric guitar, classical guitar, mandolin and keyboards) and Nick Jefferson (bass, fretless bass, electric guitar and keyboards). The pair decided to write tracks for an album without any limitations on style, length, format or target audience. They love bands like Jethro Tull, early Genesis and Van der Graaf Generator, so the resulting pieces inevitably are prog. With the the addition of legendary sax player David Jackson (Van der Graaf Generator), Mike Westergaard (keyboards, piano and backing vocals, of The Blessing) and drummer Phil Gould (founder member of Level 42) the instrumental tracks were recorded. Bill Jefferson (Natur3) and Dorie Jackson (yes, the daughter of David) joined on vocals and suddenly there was a band and an album: Fate Outsmarts Desire. And what an album it is! Opening track Hors D'Oeuvre drags you in. It's folky, proggy, and has amazing melodies, great vocals and shows superb musicianship. The song makes clear that this will be a remarkable album. Track two, Blue Bird (nearly 18 minutes long), starts with spoken words and actor Paul Gunn was drafted in to add the newsreel style voices. Normally I'm not a fan of spoken words in a song because it can be very disturbing but here it's done with great taste and it really is a great addition to the music. After the short and lovely Pearl Of The Lake, Peter Gunn returns in the beautiful and lengthy Hallsands. Tasty mandolin and fabulous flute parts give this song a Jethro Tull like feel. Four-faced Liar takes just over 4 minutes and with the radio fragments it's very special. The last song, Houdini-King Of Cards, clocks 21.26 minutes. The flute playing of David Jackson is stunning and the warm voice of Dorie Jackson was made for this song. I don't want to go into detail of every song. This is an album that gave me goosebumps every time I gave it a spin. This is music on the highest level, without any weaknesses. You need to take time to listen to this album. You will be taken by the compositions and the amazing musicianship. It's an album that makes you happy. And that's the best compliment I can give. He is right. One of the best albums I've listened to in a long, long time. Kaprekars's Constant will be performing on Progdreams VII 2018 in De Boerderij in Zoetermeer (NL).